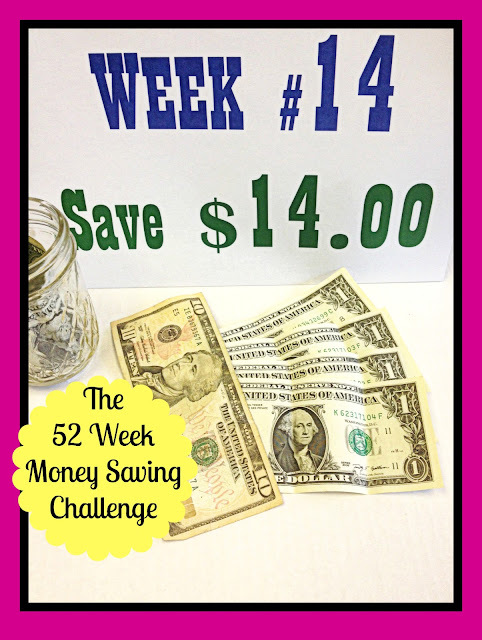 Welcome to Week #14 of The 52 Week Money Saving Challenge. This week we save fourteen dollars. Our total savings is now one hundred and five dollars. Hooray, we are finally up over the hundred dollar mark! Can you believe it is the first week in April already? What an early Easter we had this year! My grandson GERONIMO had a birthday on Easter Sunday this year. How often will that happen? Not very often at all! According to Wiki Answers: Easter will fall on March 31st on the following dates in this century: 2013, 2024, 2086, and 2097. How about you? Did you have a nice holiday? For those of you that have birthdays between March 22 and April 25, you could have some birthdays on Easter Sunday too as per blogger Stef over at Stefs Crazy Life . For weekly challenge updates, subscribe to this blog via blogger, google, or email. I guess you could also just follow me on Pinterest or Facebook. I am posting challenge updates each week there, too. At any rate, there are buttons on the right side of this web page where you can follow or subscribe. If you're new to the challenge, welcome aboard. You can start with one hundred and five dollars to catch up with us, or add a bit extra each week until you're caught up. You could also begin this week as Week #1. Whatever works best for you is fine. For a free printable chart, check out Stuck At Home Mom's 52 Week Money Challenge. Happy saving! Hi Reecea, this is a big help for me because I am a fan when it came to money saving or anything that can save. I also believe that saving money is better than making money because even if you have a lot of money but you don't know how to save it or use it on the right way it will not last.